Teleseminar & Self-Study Coaching Program: Financial Calm: Sailing Your Way Into a Sea of Prosperity from Ready2Go Marketing Solutions, Inc.
To see a sample of the self-coaching program, click here. This program will help your participants break out of their current debt predicament, if they're tired of just paying the minimum amount each month on their debts and not feeling like they're getting where they want to be with their finances. 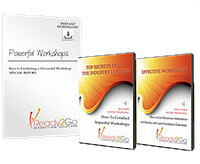 Your participants will thank you for this transformational information. And you do not even have to be a money expert to deliver these strategies and help put your participants on a path toward financial relief. Turn your teleseminar into a webinar! You can now grab the corresponding webinar slides for this teleseminar. Each webinar is professionally crafted and designed to increase participants learning and understanding of the materials presented. All you'll need to do is download the file and present the webinar! It's a complete Ready2Go webinar!